Secure one-way messenger designed for alerting and notification purposes. This clear, easy to use and light-weight IM client can be deployed on LAN or enterprise-size networks and helps you keep users informed and updated instantly. 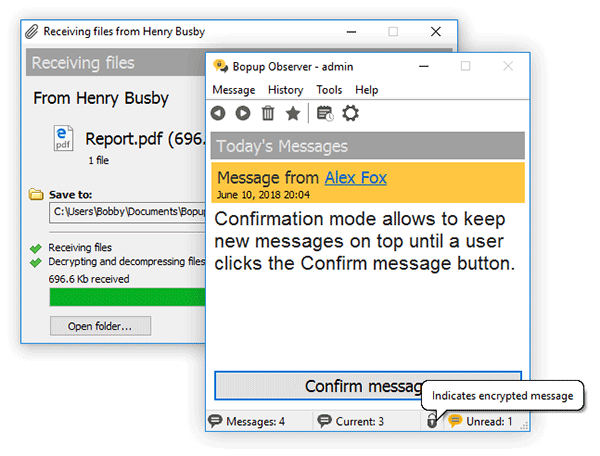 The messenger supports rich-text messages including links, font and color formatting, emotions, and it can receive files and directories from the IM server and other users. You can get urgent messages or activate the Confirmation Mode on the IM server that pops up the program when a message is received and keeps it on top until the user clicks the Confirm Message button. Messaging and File Transfer are encrypted with strong algorithms so that personal and group conversations are safe and secure even if you receive messages and files via the Internet. You will never lose any information you receive because offline messages and transfers are stored and automatically delivered by the server when the recipient goes online. The smart and comfortable user interface with advanced usability options and popup notifications allows you to join the IM network in a few mouse clicks. The messenger completely supports the Terminal Server/Citrix environment and can be used simultaneously by multiple users on one computer. Bopup Observer can automatically download and install updates from the IM server. The centralized client/server architecture offers complete and flexible management for controlling your IM infrastructure. The central server logs all user activity and archives all messages and file transfers with the reporting, search and printing options. It allows you to manage messaging groups, users' contact information and permissions to send and view other users, assign and distribute important files and documents to users. It is easy to import user accounts from your Active Directory (LDAP) catalog. Several authentication modes are supported: Simple, Windows Authentication and private login ID/password pair.